Sasami became Pretty Sammy when Tsunami decided to find one person to give the powers to. You see, Tsunami wanted to become the Queen of Juraihelm. Therefore, she must prove that she is worthy. She is the number one contestant. Then comes... Ramia. She is DETERMINED to become the Queen. To win, Tsunami gives Sasami the power to become Magical Girl Pretty Sammy so she could make the world a better place. Ramia, determined to win, made Misao Amano [Sasami's best friend] Pixy Misa, so that she could fight Pretty Sammy and keep Tsunami from winning by sabatoging her plans. Misao Amano does not know that she is Pixy Misa, though. Misao is Sasami's best friend, and is really quiet, unlike Sasami. Misao's favorite hobby is playing the piano. She is very good. Misao turns into Pixy Misa, Sasami's enemy, however she does not know anything about her alter-ego. **In Magical Project S, Tenchi only appears in one episode, and he is not Sasami's brother. He is actually an assistant director of a popular show called the "Blue Sky Rangers" (a show almost exactly like the Power Rangers.) Sasami accidentally bumps into him one day, and falls in love with Tenchi. This is Sasami and Tenchi's mother. Although Sasami always gets horrible grades, her mother's head is stuck too far into the clouds to care. She owns a CD/LD store [called CD vision], and loves singing Karaoke. She is a former upopular singer. Yep, the ditzy space-cop is back also, and an airhead once again. =) However, she is not a galaxy police officer anymore! She is still Kiyone's partner, but now they work at Chihiro Kawai's CD vision shop with Kiyone. Ayeka is in MGPS, and this time not a princess from Jurai. She's the President of the Student Body at her school, and bent on keeping Tenchi away from Ryoko. And if she gains his love by doing so, well... that's even better! [Of course she's still in love with him!] Plus, Ayeka doesn't even really know Sasami, let alone be her sister! **I'm not quite sure of her part in Magical Project S, but I know that Ayeka doesn't appear barely at all in this show. I know she does appear at least once, however, because there is a picture of her in my MPS sketch book. **Same with Ayeka's, I am not sure how she plays a part in Magical Project S.
Tsunami is still the blue haired Goddess, but plays a different role. =) She is no longer a part of Sasami, but she gave Sasami her powers as Pretty Sammy. Well, she isn't really Sasami's alter-ego anymore. Now Tsunami just watches over Sasami as she plays the role of Pretty Sammy! She is the #1 contestant for Queen of Juraihelm, and Ramia's rival. I can't help but love this little guy! He is Ramia's assistant, and recruited Pixy Misa. He can take the form of a bird, and is always there to hypnotize Misao when it is time for her to turn into Pixy Misa. Rumiya is Ramia's younger brother. The cabbit is the same as he was in the show. He is Sasami's sidekick, as Sasami and Pretty Sammy, once again! However, he has an added feature... Ryo-Ohki can actually speak like a human!!!! =) Notice anything, though? Yep.. Ryo-Ohki was a girl in Tenchi Muyo.. but in MGPS he's a boy! **Means that this character is only in Magical Project S, or it tells how they are different in each series. ***Tells which attacks are only in the manga. If you are confused, I will try to rid you of that confusion! 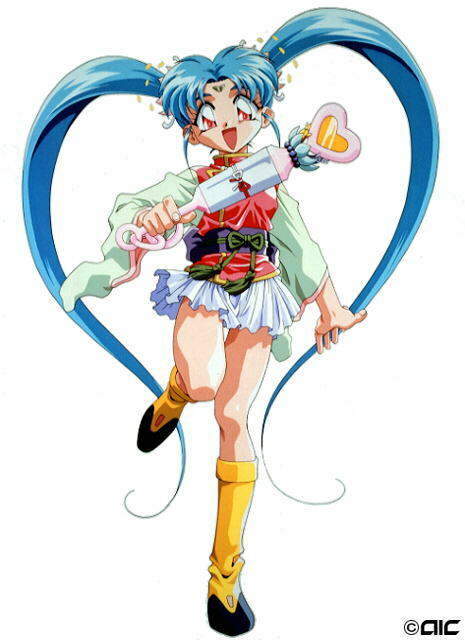 Magical Girl Pretty Sammy was the original Pretty Sammy spin-off of Tenchi Muyo, starring everyone's favorite... Sasami! ^.^ However, the feedback for this spin-off was not as good as the creators had hoped, so they decided to make a different spin-off, starring Pretty Sammy. It would be called Magical Project S, I suppose since the title sounds less "childish" than the original OAV. There are many many differences between MGPS and MPS, so I will try to share a few with you! *In Magical Project S, Sasami has an eccentric dad named Genji Kawai, however in Magical Girl Pretty Sammy, she does not appear to have a father. *In Magical Girl Pretty Sammy, Pixie Misa (Pixy Misa) is able to turn people into Love-Love monsters (much like the effect that the Generals in Sailor Moon have. ), however in Project S, Pixie Misa seems to A)create monsters that have something to do with a thing seen earlier in the episode B)Turn objects into monsters, and C) Just bring out random monsters. *The transformations are different in each, and Sasami does not find out that she is Pretty Sammy at her mom's CD store in Magical Girl Pretty Sammy like she does in Project S.